Can Salmon Farming Be Sustainable? 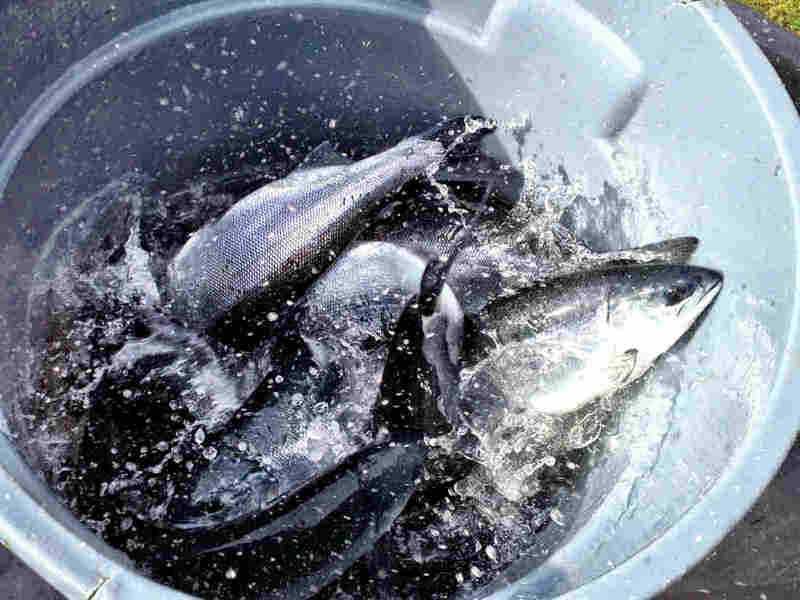 Maybe, If You Head Inland : The Salt For years, salmon farming has gotten a bad rap from marine biologists, who say the fish grown in open-ocean net pens generate pollution, disease and parasites. But now, a few salmon farms have moved on land. From an environmental standpoint, some scientists say, that's "a huge step forward." These sockeye salmon were raised at a land-based fish farm in Langley, British Columbia. Is salmon farming ever sustainable? For years, many marine biologists have argued that the floating, open-ocean net pens that produce billions of pounds of salmon per year also generate pollution, disease and parasites. In some places in western Canada, the open-ocean salmon farming industry has been blamed for the collapse of wild salmon populations in the early 2000s — though other research has challenged that claim. But now, a few salmon farms have moved inland, producing fish in land-locked cement basins separated from river and sea. One land-based fish farm in West Virginia has been commended as a sustainable alternative to conventionally produced salmon. On Vancouver Island, there is at least one such facility. And just last month, Willowfield Enterprises, based in Langley, British Columbia, harvested its first inland-farmed sockeye salmon, to be marketed under the brand name West Creek. Sockeye is a Pacific species that has rarely been cultivated before. "In terms of environmental sustainability, I think [these closed-system farms are] a huge step forward," says Martin Krkosek, an assistant professor at the University of Toronto who has been among the leading critics of ocean net pen salmon production. "Waste material, disease, pollution, parasites — all these things aren't a concern with most closed-system aquaculture." Some forms of aquaculture may have the potential to help ecosystems by taking fishing pressure off of wild fish stocks. But this hasn't been the case with the salmon farming industry, argues Daniel Pauly, a professor of fisheries at the University of British Columbia. One reason why, Pauly tells The Salt, is that the food that salmon farmers feed to their fish is usually fish meal made from wild — sometimes overfished — species. He points out that humans could be eating these species instead of farmed salmon. 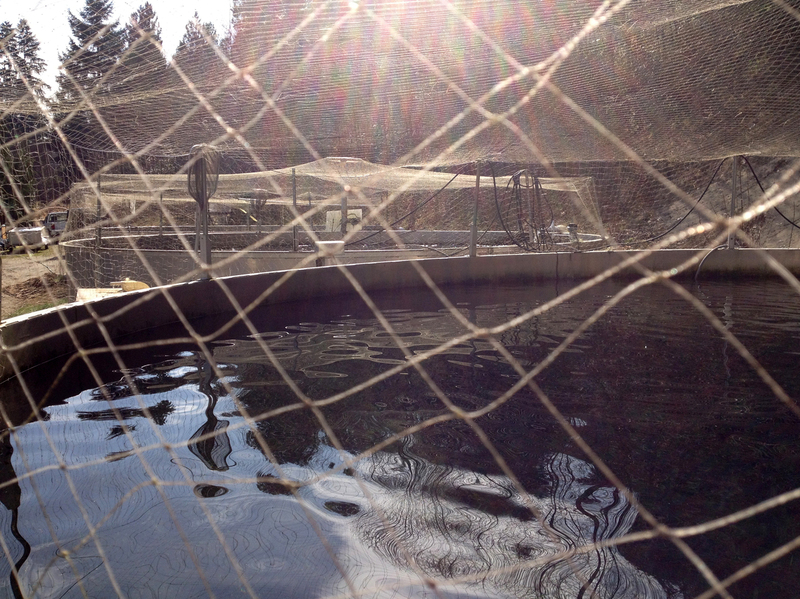 A view of one of Willowfield's land-locked sockeye tanks. Open-ocean salmon farms can also generate high densities of organic and inorganic waste material — which can cause toxic marine algae blooms and create low-oxygen "dead zones." Residues from antibiotics and other chemical treatments can also drift from the pens. And then there's sea lice. These pea-sized copepods cling to free-moving fish, and under natural circumstances, they aren't usually a threat to salmon. But when many thousands of adult salmon swarm together in crowded net pens, sea lice populations often boom. When juvenile salmon exiting the rivers of their birth pass near such infested pens, the smolts may be swarmed by the parasites and quickly killed. By this process, salmon farms have caused entire runs of wild fish to nearly disappear from streams in the Vancouver Island area, according to Krkosek's research. The Monterey Bay Aquarium's Seafood Watch program advises consumers to avoid farmed salmon in general, but it makes a specific exception for farmed salmon from contained systems, which the aquarium recommends, according to spokesperson Alison Barratt. Likewise, the Vancouver Aquarium's seafood rating program, called Ocean Wise, has not approved as "sustainable" a single open-ocean salmon farm, says Teddie Geach, an Ocean Wise representative in Vancouver. However, Ocean Wise has given West Creek's sockeye salmon a top sustainability grade, based on assessments of several criteria. These include the risk of diseases and parasites spreading from farmed fish to wild, and the risk that farmed fish will escape, which can negatively affect the gene pool of wild fish. And then there's something called the "feed conversion ratio," a measure of resource efficiency that considers how much food a given fish species requires to produce each pound of marketable product. "The closer that ratio is to 1 to 1, the better," Geach says. "You don't want a 10-to-1 ratio." Krkosek says the feed-conversion ratio of farmed salmon "is improving" and several years ago was about 5 to 1. Wild salmon, he says, are probably less efficient at converting food into flesh, since they are not eating an engineered, optimized nutrition formula, and because they expend great amounts of energy that farmed salmon do not. Inland aquaculture facilities may be a more environmentally sound way to farm salmon than their open-ocean counterparts. But Krkosek says it's not yet clear whether it would be feasible for the entire salmon farming industry — which produced 5 billion pounds of fish in 2012 — to make the move. He says "new environmental problems" would likely arise — "probably mostly associated with energy and water consumption." Krkosek also notes that right now, the economics favor cheaper, conventionally farmed salmon. "In the open-ocean pens, they get clean water and waste disposal for free," he says, adding, "Everyone's waiting to see if the economics work out. But currently, the common refrain in the salmon farming industry [about inland farms] is, 'It's too expensive.' "
Willowfield Enterprises President Don Read, who is farming the West Creek sockeye with partner Lawrence Albright, says his fish sells for about double the price of conventionally farmed salmon and for about 20 percent more than wild sockeye. "We can't compete with open-ocean aquaculture, but that's today, and maybe we'll get there," Read says. "For now, our fish will be a niche player in the salmon industry."